A few years ago I started getting very intrigued by facial oils. As someone with oily, acne prone skin it took me some time to realize that even my skin could benefit from the use of facial oils. At first I was sure that they were only for dry skin and would make me break out. But once I started using facial oils I was hooked. I even tried my hand at mixing up my own serums which was only fairly successful. Some things are best left to the professional skincare makers. Everyone, no matter their skin type, can benefit from using facial oils. You just need to find the right one for your skin. For some people they can even the replace the need for a facial moisturizer. Facial oils leave my skin soft and give it a great glow without feeling heavy. Some times I put a drop or two directly on my skin or layer on top of my moisturizer. You only need a little bit when using a facial oil so this actually can be quite a cost effective skincare product. Recently I had the opportunity to try facial serums by Charelle. The company was founded by Sima Herzfeld Navon, an aromatherapist, and Dr. Pnina Farkas, a cosmetic dermatologist. These all natural products aim to bring together the best of a chemical free skincare philosophy with Western skincare science. I was certainly intrigued by the fact that a dermatologist would come out with all natural skincare product line. Currently, the company sells 2 serum lines and a facial soap. The Bria serums (one for AM and one for PM) are meant for women 35 years old and over, while the Golden Glow serums (also has AM and PM versions) are for women 50 years old and over. While I prefer to recommend skincare products based solely on what the skin needs and not a person’s age, the reasoning behind dividing the serums based on age comes from the amount of estrogen in the body. As you probably already know, as we age the amount of estrogen in the body (and the skin) decreases which can lead to dry skin and wrinkles. The ingredients in the serums are meant to help combat this skincare issue and so dividing their use by age becomes more important. The serums are available in AM and PM versions. The PM version contains ingredients that are be photosensitive and as such should not be used during the day. These products are a mix of plant and nut oils along with essential oils which makes them not just great for your skin but mood enhancing as well because of the scents. I tried all 4 serums and loved them. While the scent can be quite strong in some of the serums it does fade over time. A little bit goes a long way with these serums which is great. They left my skin soft and smooth and with a wonderful, healthy glow. Over time I am sure that they can help the skin look younger. I also had a chance to try the Visage Exfoliating Cleanser and was happily surprised how soft my skin felt after using it. This soap is highly recommended especially for people with dry skin. All the products can be easily purchased through the company’s website. If using all natural, chemical free products is important to you definitely check out these products. If you are looking for a facial serum I recommend giving Charelle’s a try. I was definitely happy I used them. I like to think of myself as up to date about skincare ingredients and products, but somehow hydrosols were off my radar until a few months ago. Now I am a devotee of this skincare product and am happy to recommend their use to other estheticians and clients. When plants are steam distilled for their essential oils, this process will release several compounds – some of which are soluble in water and will therefore end up in the hydrosol at the end of the process. Hydrosols contain the water from the distillation process as well as the herbal extracts from the plant. The essential oil droplets will float on top of this distillate and these tiny quantities are then removed to be sold. Keep in mind that hydrosols are not simply essential oils added to water. Hydrosols contain all the properties of the essential oil, just highly diluted which makes them much more gentle. Hydrosols can also be used directly on the skin, unlike essential oils that should never to applied directly to the skin. That’s what makes hydrosols so versatile and wonderful – they can provide your skin with the all the benefits of essential oils without any fear of irritation and negative reaction. Be sure you trust your supplier when buying hydrosols since they can be contaminated or diluted with alcohol. You could, of course, make your own hydrosol if you were so inclined. Just as essential oils have different properties so do hydrosols. The properties of the hydrosol are the same as the plant or essential oil they came from, just much more gentle so they can be used even on sensitive, irritated skin. I work with clients who are undergoing chemotherapy and have very sensitive, compromised skin; I can use a hydrosol on the skin of such a client but not an essential oil. use them like a toner – apply to a cotton pad and swipe across the face. add them to a clay mask (or any mask) instead of water. Personally I use hydrosols during facials just like I would toner and I add them to the masks I create for clients at the end of a facial. But the sky’s the limit – there are a multitude of ways to use hydrosols both for your skin and for your home. *I’m newly obsessed with the website Herb and Hedgerow. Though the articles on the site are a few years old, I find that they are clearly written, interesting, and very informative. Some time ago I wrote an article for About.com about the so-called caveman regime which simply means you stop washing your face. I’m definitely one of the last people to tell you to stop washing your face. My belief in how important face washing is was only strengthened by what I read happened to people’s faces when they stopped washing them. There are a variety of reasons why people decide to stop washing their faces – their skin is sensitive and they feel like facial cleansers are harming their skin instead of helping it, they think they are applying too many chemicals and products to their faces, or they connect a certain lifestyle choice (like eating a Paleo diet) with not washing their face, i.e. do as the cavemen would have done. As I already wrote above after reading about what happened to people’s skin when they didn’t wash their face, I definitely was not about to try this myself. I’m the last person who wants a build up of dead skin cells all over their face. One part of what I read about these no-wash experiments was intriguing – people who had sensitive, easily irritated skin found that their skin calmed down after they stopped washing it. This could be true because of what happens when you stop washing your face. Firstly, dead skin cells build up and literally sit on top of your skin, but not washing can actually restore your skin’s protective barrier (or acid mantle) which potentially could mean your skin will start “behaving” better – will be calm, acne free, less irritated, not red, etc. By not washing your face you are allowing your skin to perform its duties – protecting, hydrating, and healing. One reason for someone’s skin improving in both look and texture after they stop washing it or stop using all other skincare products as well is the fact that bacteria, good bacteria, starts proliferating on the surface of the skin. This good bacteria helps to kill acne causing bad bacteria and provides the skin with protection from outside sources that can irritate it. The more good bacteria on your skin means that skin conditions like eczema and rosecea won’t flair up as much. The idea of increasing the good bacteria on the skin, allowing the skin to heal itself, and just basically getting out of the way of “interfering” with your skin’s functions is a skincare idea that I find very intriguing even though my own daily, far from minimalist skincare routine is the opposite of those skincare ideas. I’ve been reading about bacteria and probiotics (good bacteria) in skincare products for years and wrote a post on this topic in the past. While not every expert thinks that applying topical skincare products with pre-biotics, probiotics, or bacteria to the skin is helpful, the number of products with these ingredients keeps growing (pun intended). There is also the fermented skincare trend which came to the West from South Korea. At this point you are probably wondering what all this has to do with photo at the top of this blog post. Let me explain. After my article on not washing your face was published on About.com I received an email from a PR person asking if I wanted to try Mother Dirt products. What did my article have to do with this company’s products? Well Mother Dirt sells bacteria to spray on your body and heal your skin. Yes, bacteria you spray on your face or somewhere else on your body. This product is far from something that was created overnight in order to jump on a skincare trend. In May, 2014 an article appeared in The New York Times Magazine that chronicled the writer’s experience with not washing (body or hair) for a month and twice a day spraying her body and hair with ammonia-oxidizing bacteria instead. After an initial gross period, the writer reported that her skin was softer, smoother, and breakout free because good bacteria had started to grow on her skin. Once the month ended and the writer went back to using regular skincare products and washing as she had before the good bacteria disappeared from her skin. The skin friendly bacteria discussed in this article eventually made its way into Mother Dirt’s signature product – AO+ Mist, and is now available for all consumers. While the Mother Dirt website is very thorough and is great at explaining both the science and the everyday use of their products, I’ll elaborate a little bit here as to what the product is supposed to do. Mother Dirt’s proposes that in today’s world people are “too clean”, washing down the drain on a daily basis the good bacteria on their skin that is supposed to protect our skin and keep it healthy. When this occurs our skin suffers – becomes sensitive and easily irritated, red, acne appears regularly, and our skin is dry. Having healthy skin is as easy as spraying this mist on our skin at least once a day. The company says that with regular use you won’t need as many skincare products including deodorant. Keeping all this in mind I was obviously intrigued. So when the company offered to send me some products to try for free I jumped at the chance. My Mother Dirt products arrived via messenger in a cool, silver padded envelope (yes, I am easily impressed by shiny things). The company sent me a few bottles of the AO+ Mist, their cleanser (which has no SLS, more on that later), and their moisturizer to try for free. The company also makes a shampoo that they did not send me to try which is too bad since I would have loved to try it. I suffer from seborrhea on my scalp and always use a special, medicated shampoo so I would have been happy to see if this product would have helped to relieve my itchy scalp. The real star here in the AO+ Mist. The other products are meant to treat your skin gently without getting in the way of the good bacteria that is supposed to start growing on your body. I decided that everyone in my family needed to try the products. My husband suffers from dry, itchy skin, my son has dry skin, and my daughter has easily irritated skin. I did momentarily consider ditching all my facial serums, nightly retinol cream, and morning peptide cream to see how my skin would react to spraying the bacteria on it, but I just couldn’t do it. Instead I decided to use the spray twice a day on my chest. My chest is an area of skin embarrassment for me. It is covered by red dots that sometimes have white heads on them. At first I thought I had acne there and tried to treat my skin for acne. Nothing changed. Eventually I realized that I simply had skin irritation in that area that looks like a lot like acne. I always think twice before wearing a shirt with a v-neck because the area is most unsightly. I hoped that using the AO+ Mist would clear up my skin irritation by helping my skin heal itself. My husband and son dropped out of this skin routine experiment a day after they started. They had no interest in remembering to use the spray. My daughter is still quite young so she had no choice other than to be part of this experiment. I used the spray on her after bath time, washed her with the soap, and moisturized her with moisturizer. I sprayed the mist on my chest and underarms, washed with the soap, and moisturized with the moisturizer. I was pleased to see that the soap was SLS free. SLS can be quite irritating to many people’s skin and though some companies have taken it out of their products it is still very widely used. I’ve decided to avoid SLS for my daughter’s skin since she has experienced red, itchy skin in the past that cleared up once I started using a SLS free soap on her skin. Despite having no SLS in it, the soap still foams very nicely and cleaned the skin well yet gently. Mother Dirt states that when it comes their moisturizer less is more which turned out to be true but it took me time to realize just how much I really needed and how to use it. In addition, if you think of moisturizers as always being creams this product will confuse you since it is a liquid. It feels and looks like an oil. It does moisturize effectively once you get used to its feel and figure out just how much you need. I can’t say how long it will actually last you, but I think you could easily have it on hand for about 2 months or more. But you are probably wondering about the bacteria spray more than any other product I tried. You need to keep in in the refrigerator once you open it (or even before) so it is cold when you spray it on your skin. This made the product less than pleasant to use during the winter. Though I did spray it once or even twice a day on my underarms since it was winter I really couldn’t tell if it helped balance out the bacteria in that area and made deodorant less necessary since I don’t need much deodorant as is during the winter. Now did the mist helped heal the skin irritation on my chest? Well yes it did! It took over a month to see a difference which didn’t surprise me since real skin changes take time. I didn’t wash that area with soap during the time I used the spray (not even with the Mother Dirt soap), but water did wash over the area each time I showered. My skin finally became little, red bump free after using the AO+ Mist. BUT as soon as I stopped using the spray the bumps returned which is quite frustrating. When it came to my daughter’s skin the products kept her sensitive skin irritation and rash free. Her skin was also soft. I passed along one bottle of the AO+ Mist to a friend who had hormonal breakouts on her back. She definitely saw an improvement in her bacne after regularly using the product. Would I Recommend Mother Dirt? I would definitely recommend Mother Dirt products for people with sensitive, easily irritated skin, and those who suffer from regular breakouts. These products will not get rid of hyperpigmentation for example or treat cystic acne, but they definitely can be helpful for people with sensitive skin. People who want products with few and easily understandable ingredients will like Mother Dirt’s products. I applaud the company’s transparency and innovation. Winter can bring about a lot of unpleasant skin changes – dry and itchy skin, red and irritated skin, cracked hands, chapped lips. Fun, right? As always I want to help my readers best care for their skin under any weather conditions, but instead of writing a new post about winter skin care I’m going to share my older posts on the topic. Looking back at my previous posts I realized I had covered so many issues related to winter skincare that, at the moment, there wasn’t something new to add. Happy reading and wishing you beautiful and healthy skin during the winter! Any mother with a newborn or a baby knows one thing for sure – your baby’s needs always come before yours. That’s just the way it is. Finding time for yourself, not to mention household chores, sometimes seems like the most impossible thing ever when you have a baby at home. 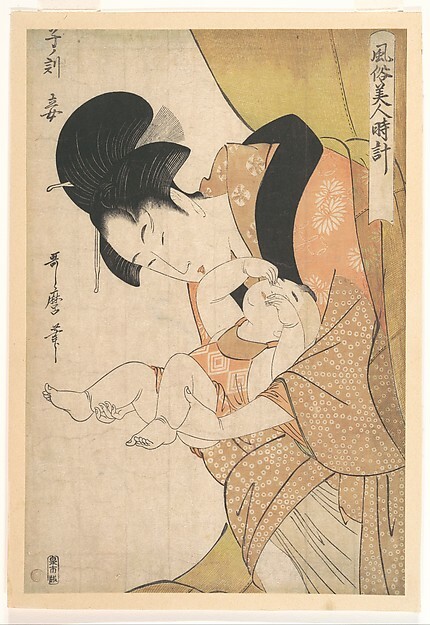 Depending on how much sleep you are getting, probably very little, taking care of yourself quickly falls by the wayside once you have a baby. So I’m here to remind you that even when you have no energy or it seems to silly to invest in your appearance because so many other things require your immediate attention, that you should and can take five to ten minutes a day for yourself each day. Believe me I know how ridiculous that sounds when you’ve had four hours of sleep or when your baby decided to start their day at 5 am. It’s hard; it seems pointless, but consider giving it a try. Yes, if you had an elaborate skincare routine before you gave birth you probably can’t keep up with it now. Don’t beat yourself up about that. Keep in mind that when you feel good about how you look (even if you haven’t lost all the baby weight and that takes lots of time) your outlook changes about everything around you. So don’t neglect yourself after you’ve had a baby. Do take a few minutes each day to concentrate on your appearance; there is nothing selfish or wrong about that. Remember to wash your face – at the very least at night. Once you’ve gotten your baby to sleep (or passed off childcare to your partner) take a moment to wash your face. Use sunscreen! Take a moment in the morning to apply sunscreen. In case you need a reminder about why sunscreen is so important take a look at this video. If your skin really needs a moisturizer use one with SPF in order to cut-down on skincare routine steps until you have more time for yourself. Find an under-eye concealer you like and use it. Use multitasking make-up products like Nars The Multiple which is for both lips and cheeks. Think about what beauty or make-up product always makes you feel good and use it. Is that product mascara? Or a facial mask once a week? Don’t give up those feel good products. The baby can cry for a moment while you apply your mascara and everything will still be fine with the world. Is there a beauty service that you really can’t live without? Well don’t! For a lot of women getting their eyebrows professionally waxed is just something they can’t give up and in my opinion shouldn’t. Eyebrow waxing when compared to other beauty services is one of the fastest and cheapest services out there. You can probably even bring your baby along to your eyebrow wax so keep up with having well groomed brows. Remember that having your eyebrows waxed or tweezed can change the look for your entire appearance for the better. For other people their weekly manicure is a must so I fully endorse finding the time to keep up with the beauty service that makes you feel like yourself again after giving birth. Keep in mind that there are many estheticians and nail techs that will come to your home to provide services so if you really can’t leave your baby or don’t want to have the service come to you. I strongly believe that the better we feel about ourselves the better parents we can be. So even if it’s only a few minutes each day take that time for you. Even your baby will appreciate it. Understanding the ingredients listed in the ingredient list of a skincare product and figuring out if those ingredients are actually effective for your skin is an important skill for skincare consumers to have. But interpreting a skincare ingredient label is not easy by any stretch of the imagination. You need to not only have some basic skincare product formulation knowledge but also be able to recognize different ingredients and their function in skincare products in order to understand what you are reading and if the product will be right for your skin and will do what it claims to do. I’ve addressed this topic in the past here in my blog, but lately I’ve come across a few interesting articles on the subject and thought it was time to revisit this issue much more in-depth than I did before. There are basic rules that product manufacturers must comply with in order to list ingredients on their products. Standardized names. Ingredient names must comply with the International Nomenclature for Cosmetic Ingredients (INCI) format. The ingredient names are standardized in this format so that all products can be compared to each other easily and for safety reasons. When looking at most product ingredients lists, the ingredients will be in order from the highest concentration to the lowest. Typically, when deciding if a moisturiser will suit your skin type, you don’t need to look past the first 6 ingredients or so, since they make up the majority of the product, and will be responsible for the moisturising action. It’s a different story when you’re looking at more potent ingredients that target specific concerns (e.g. anti-aging, exfoliants, antibacterials, lightening), but those tend to be useful regardless of skin type. With this in mind, I’ll be classifying the top 6 ingredients in each of these facial moisturisers, as well as commenting on some of the notable ingredients further down in the list. If there’s no comment next to the ingredient, I’ve probably explained it in a product further up. Humectants – draw moisture to the skin, effective even at lower percentages. Aqua (water) – The base for most face creams, and the definition of moisture. Cetearyl alcohol (emollient) – A blend of cetyl and stearyl alcohols, two fatty alcohols that are nothing like drinking alcohol (that is, ethyl alcohol), but are great for smoothing skin down as well as making sure the oily and watery parts of the moisturiser don’t separate (it’s an emulsifier). It can be derived from coconut oil. Rosa canina fruit oil (emollient) – This is the technical name for rose hip oil from a specific species of rose. It mainly contains oleic and linoleic acids, which are excellent for repairing skin, as well as antioxidants. Safflower seed oil (emollient/occlusive) – This also contains many linoleic acids and antioxidants. Caprylic/capric triglyceride (emollient/occlusive) – This also comes from coconut oil, and smooths skin as well as blocks evaporation. Jojoba seed oil (emollient) – This stuff is a lot like natural sebum. Glycerin and honey are a little further down in the list, and there’s aloe vera extract as well – these humectants together would probably add noticeable humectant action to the mix (glycerin is typically used in moisturisers at 2-7%, otherwise it feels sticky). Overall: Lots of emollients, a small amount of occlusives and some humectants. It’s suitable for all skin due to all the skin-repairing emollients, but drier skins might need some more occlusives on top. Generally, serums are used to deliver active ingredients to skin in higher concentrations in order to generate a specific skin response. Typical serums address skin-specific issues, such as hyperpigmentation, lines and wrinkles, sagging skin, texture, tone, pore size, acne, redness and irritation. Understanding ingredient listings in serums is often difficult. Active ingredient names can take the form of Latin names for botanically sourced compounds, and more generic INCI names may be used, such as yeast extract, which can mean a multitude of biologically active ingredients. Quite long chemical names are often found. Understanding the dose of active ingredients is also difficult by trying to interpret ingredient listings. If a particularly active ingredient is very biologically active, it may be dosed in the formula in part-per-million levels and be very low in the ingredient listing, but still be quite effective. Examples of these are epigenetic factors, epidermal growth factors and vascular growth factors. 1. There are more than 16,000 listings in the INCI dictionary. No one can know all the cosmetic ingredients at any given time. If you are unsure what dose and what active ingredient is in particular serum, request that the manufacturer supply that detailed information. 2. Watch out for serum claims and their target biology. For example, if you have a serum that claims it can improve collagen and elastin by stimulating skin, the ingredient would need to penetrate to the dermal tissue. If you need to lighten skin, ingredients must penetrate no more than to the epidermal-dermal junction, where color-producing cells exist. If you want to exfoliate, the serum should not penetrate far below the stratum corneum. With so much awareness on skin care ingredients (the good, the bad and the ugly), consumers now more than ever are getting educated on what’s used in formulas, so they can make the best choices for their skin when it comes to choosing products to apply to their face. But by looking at an ingredient list on the back of a bottle or jar, can you really determine if it will deliver good results or not on your skin? The answer is no. You might look at the ingredient list and form assumptions about the ingredients you may have read about or heard of. For example, if you’re prone to breakouts you might see shea butter or sunflower oil listed, and assume it will be greasy and pore clogging. These assumptions can be invalid, because the results a product delivers are based on the percentages of the ingredient used in a product—and this, you’ll never know from looking at the list on the back of a bottle. It is important to learn about ingredients and how skincare products are formulated in order to be an educated skincare consumer. The more you know the better choices you can make for your skin, and you can save yourself time and money from buying the wrong products. Part of that education is learning to read a skincare label instead of just blindly believing the manufacturers’ hype and marketing campaign. But don’t let the skincare label be your be all or end all in order to know if a skincare product is right for you. Try products first before rebuffing them. Ask for samples and find online reviews from people who have actually tried the product before rejecting a product based just on reading the ingredient list or taking advice from someone who reviews products only according to their ingredient list. Two websites that I like for product reviews combine both information about the products’ ingredients and actually try the products themselves before writing a review. Those websites are FutureDerm and Lab Muffin. One last thing – ever wondered what all those symbols (letters, numbers, and pictures) are on your beauty product container? Into the Gloss has a guide that explains them all. This post was inspired by something I saw on Facebook. 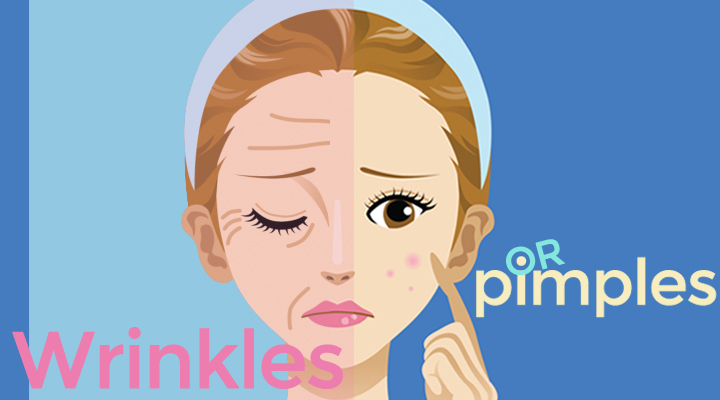 The reality for many women is just as they start to see wrinkles on their skin (perhaps around the eyes or on the forehead for example) they still get an occasional pimple. This can be both frustrating and confusing. Yet it isn’t so difficult to find one solution for both skincare issues. I would like to point out that the skincare phenomena I am writing about here is not adult acne. While adult acne is definitely on the rise, I am referring here to people who are probably in their late 30s, early 40s and are starting to see the emergence of fine lines while still occasionally experiencing breakouts (for women perhaps around the time they get their period). This is also different from women who are undergoing menopause and find that they are all of a sudden breaking out. I’ve blogged about both adult acne and menopause’s effects on the skin in the past. Those posts are listed below if you would like to look at them. In my opinion what is happening here is simple: you are starting to see fine lines because sun damage from years before is now becoming visible, and you are still experiencing an occasional breakout because of your hormones (especially those related to your period) and/or stress. Just as I see the cause of this skincare issue as fairly straightforward so is, in my opinion, the solution: add a retinol cream to your skincare regime at night, make sure you use sunscreen daily, and use an antioxidant serum every day. Be sure not to go overboard in order to improve the appearance of your skin. Do not start using anti-acne products meant for teenagers such as Stridex or Clean & Clear. These products will be much too harsh for pretty much anyone who isn’t a teenager anymore. Retinol is a form of vitamin A. Other forms of vitamin A in skincare that you may be familiar with include isotretinoin (better known as Accutane) and retinyl palmitate (another topical ingredient found in many creams). Retinoids are skin cell normalizers so that means that they speed up skin cell turn-over which will help clear up breakouts, and retinoids help rebuild collagen so they will minimize the appearance of fine lines and wrinkles over time. As such adding a retinol product to your skincare regime is the perfect solution for both fine lines and breakouts. Retinols can be irritating to the skin, and cause dehydration. To reduce the chances of this happening, you should introduce it into your routine slowly (don’t use it every day to begin with), and use extra hydrating moisturisers. Retinol breaks down with exposure to light and air. Pick a retinol product in an airtight, opaque container to improve its shelf life. Using retinol with other excellent skin treatments like AHAs and vitamin C can speed up the skin renewal process, fading hyperpigmentation and wrinkles faster. However, the activation of retinol by skin enzymes is optimal at a higher pH (5.5-6) than the pH for AHAs (3.5). While there isn’t much research on how quickly the pH of skin readjusts itself, waiting an hour or so in between applying the two is a safe bet, or even using one in the morning and one in the evening. Retinol, much like AHAs, can make the skin more susceptible to sunburn. Wear extra sunscreen when you use retinol so you don’t completely reverse its beneficial effects! Lastly, keep in mind that you cannot use Retin-A or retinols when pregnant or nursing. So how would this anti-aging, anti-acne skincare regime look? I suggest cleansing twice daily with a mild cleanser, applying an antioxidant serum in the morning (such as a Vitamin C serum in order to boost the effectiveness of your sunscreen, further prevent the signs of aging, protect your skin from inflammation), and then using a sunscreen with a spf between 30 to 50 (you can also use a separate moisturizer before your sunscreen if you feel your skin needs it). In the evening after cleansing apply a retinol cream followed by a moisturizer. Pretty simple, right? While I am not familiar with all the recommended products in this article I like the approach of this skincare regime since the recommended products are not too harsh. Remember there is no need to buy just anti-acne products if you only experience an occasional breakout. Cleanser: I suggest using a mild cleanser such as CeraVe or even Cetaphil. You don’t need to use an anti-acne cleanser. That would be overkill for most people. Antioxidant serum: See my previous posts below for more information about why you want to use an antioxidant serum and in particular a Vitamin C serum. There are quite a few good (and even great) Vitamin C serums out there, but at the moment my recommendation is to buy one from South Korea. OST Original Pure Vitamin C20 Serum is excellent and super affordable (even when you factor in the shipping costs). I am using it now and love it. Moisturizers and Sunscreens: Choose your products according to your skincare needs and the weather in the area you live in. Some people may need a richer moisturizer and others not so much especially if you live in a humid climate. Now that Target is selling some of my favorite skincare lines making them accessible to all I would recommend Laneige Water Sleeping Mask as a moisturizer (don’t be put off by the name; it’s a moisturizer), particularly as a nighttime one, and any La Roche-Posay sunscreen, particularly Anthelios Ultra Light spf 60. Retinol Creams or Serums: There are also numerous retinol products on the market including ones from Roc and Neutrogena, but for my money I would try either La Roche-Posay Effaclar K Daily Renovating Acne Treatment (if you have blackheads and more than just the occasional breakout) or La Roche-Posay Redermic R (if you only have an occasional breakout).